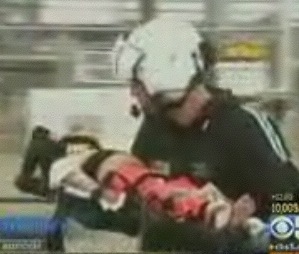 A lucky California toddler is alive after falling 30 feet from an apartment window and landing on concrete and rocks. Contra Costa County Fire Capt. Charles Thomas says the 22-month-old boy was alert and crying after the three-story plunge yesterday that left him with just a cut on his abdomen, a bruised lung and a bump on his head. He appeared to have climbed onto a table near an open window and fell after pushing against the screen. He landed on concrete and a bed of rocks. Doctor said that because the toddler was so young, his bones have not fully developed and are mailable. This may have helped him ‘bounce’ causing a better outcome. Sarah Michelle Gellar Shows Off Her Post-Baby Body!